I’ve been itching to write this post but I had to wait until my VUL plan’s cash surrender value (CSV) became available in Sun Link Online to complete my data. I was able to access my CSV yesterday so let’s do this! 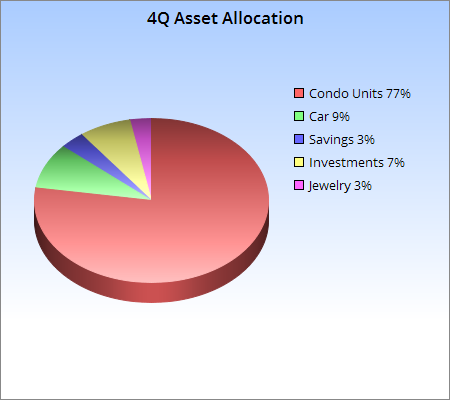 The long and short of it is that just like last quarter, our assets barely moved at all, as in there was only a 0.34% increase from the last time I crunched the numbers. Although I was able to add a respectable sum to our emergency funds, it is still quite a long way before we reach our household goal of Php200,000. Also, I still haven’t been able to top up my FAMI-SALEF and coupled with last year’s lackluster performance, my equity funds have been meh and bleh. Unlike my FAMI-SALEF though, I was able to top up my Sun Life balanced funds once during the quarter but the gains seem to merely reflect my top up without any noticeable increase outside of that. Again, just like FAMI-SALEF, my Sun Life balanced funds have been lackluster. What is it with mutual funds being so ho-hum this year? Is this the effect of the high fees? Is it time to go into index funds? While our assets may have been catatonic, our liabilities saw a great dip of 20.98% because of my monthly debt payments to my folks as well as paying off their phone and credit card bills in order to offset these with my balance. At the rate we’re going, I might just finish paying off my debts to the Bank of Mom and Dad before the year ends or by first quarter of next year. For the PAG-IBIG loans, our mortgage principal went down by about Php5,000 for each loan, meaning that for the Php18,000 I remitted per mortgage for the last quarter, only Php5,000 was deducted from the principal and the rest went to interest payment (sigh). I can’t wait to start making extra payments to our mortgage to bring down the principal ASAP. The goal is to be mortgage free in 3-5 years. To sum it all up, our net worth increased by 5.12% from last quarter, brought primarily about by the decrease in liabilities. We could have done better though because I didn’t include in the assets column the cash I’ve been setting aside for our kitchen renovations which will finally begin next month. I’ll blog more about that in the future. But for what it’s worth, I’m glad that despite the increase in liabilities, our net worth still showed a steady, albeit slow climb every quarter which means we’re on the right track. However, we can still do so much better (i.e. less impulse purchases and vacations) and I can’t wait for the time when most of our cash won’t go towards bringing down our liabilities and will instead be directed towards building up our assets. Hopefully we can start doing that by the last quarter of this year. * For the past net worth reports, please click here , here and here. Hi Jill, do you have info on the PERA? I read somewhere it'll be implemented starting this year. I hope it push through, the tax advantage on capital gains sure looks promising. Back to the mighty index funds, last quarter's performance of individual funds actually did better than the index. I initially thought it a good idea too but the d*mn fees! I cannot justify a passive investment that charge so much. But I digress. I'm just gonna look forward for the tax-advantaged IRA/PERA law to get started, or maybe start on a high-dividend equity fund. We shall see. Cheers. I know the guidelines have been approved by the BSP and they should be ready to roll it out by this month(!). So far, I only know of two banks, BPI and BDO, that will offer PERA accredited products that's why I was thinking of opening a BPI Index Fund to act as my retirement fund and take advantage of the PERA benefits. I remember I also saw an interview on this last November. Exciting times ahead!